Rowman & Littlefield Publishers, 9781493034154, 320pp. The Homesteader's Herbal Companion is a beautiful guide for the modern day homesteader. From learning how to incorporate herbs and essential oils around your home, to learning how to enhance your family's health and well-being, this book is the go-to resource for those wishing to live a more natural homesteading lifestyle. This book takes readers through the basics of herbalism, including the different types of herbs and their uses. It also breaks down how herbs are used in tinctures, salves, essential oils, and infused oils. You'll learn how to efficiently incorporate herbs into your lifestyle, creating your own herbal remedy cabinet for yourself and for your livestock as well. And through encouragement and evidence-based information, you'll be confident using herbs, cooking with herbs, and sharing your herbal products with your friends and family. 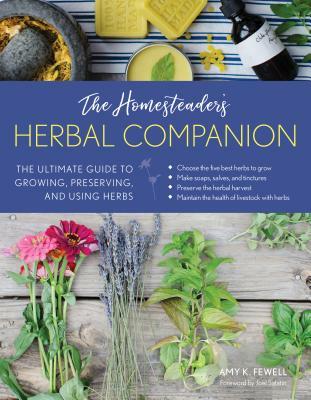 With an array of beautiful photos and easy to read terminology, just about any homesteader, new or seasoned, can learn from The Homesteader's Herbal Companion, and finally feel comfortable incorporating the many wonderful qualities of herbs around their homes and homesteads.